Bayan Olgii, the western-most aimag in Mongolia, is closer to Kazakstan than it is to Ulaanbaatar, and 90 per cent of the population is ethnic Kazakh. The Kazakhs have a a language, culture and religion distinct from the rest of Mongolia, and even if you've spent months in other provinces, Bayan Olgii will feel like a whole new country (it does to most Mongolians, as well!). Kazakhs speak Kazakh. Mongolians speak Mongolian. Most Kazakhs learned Mongolian in school, and can communicate effectively with Mongolians, while Mongolians are less likely to understand Kazakh. Factor this in if you're intending to use a guide in Bayan Olgii. The mountainous regions of West Mongolia were not of signficant interest to the Chinese or Russians until the 20th Century, and the borders were loosely defined and rarely patrolled. 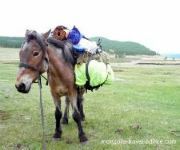 Kazakh nomads had been traveling between modern-day Mongolia and Kazakhstan for hundreds of years. From the late 16th century, the Russian czars began drawing Kazkhstan into their sphere of influence, building military outposts in an effort to expand their empire and strengthen it against the British. From about 1890, the Russians began settling Kazakhstan in ernest, colonizing its lands and attempting to force Russian culture and customs onto the Kazakh people. Almost half a million Russians settled in Kazakhstan in the first decades of the 20th century, and were soon joined by over a million Germans and Slavs by 1930. The life of the Kazakh nomads was particularly targetted for 'Russification', as the colonizers attempted to civilize the traditional herders and convert them to a more sedentary lifestyle. As with all colonial invasions, the best grazing lands and watered sites were taken by the settlers, which soon resulted in a series of violent uprisings which were brutally suppressed by the Russians. Kazakhstan fell under formal Russian rule in 1920 (becoming part of the USSR), and those Kazakh nomads intent on preserving their lives, or at least their way of life, moved permanently to their grazing grounds over the Altai mountains, in modern day Mongolia. Unfortunately, the Kazakhs only had a few short years of relative peace before Mongolia became the world's second communist state in 1924; while Mongolia managed to remain an independent State, it was strongly aligned with and influenced by the Soviet Union. The Kazakhs in Mongolia were subject to the same purges, forced collectivization, and cultural and religious destruction as other Mongolians, but due to their determination and their distance from Ulan Bator they survived with their culture and way of life somewhat intact. They certainly survived far better than Kazakhstan, where the culture has been far more Russified and modernized, and the ethnic make-up diluted by foreigners. To illustrate the uniqueness of the Kazakh population in Mongolia: when I was in Olgii a few months ago I met some university students from Kazakhstan down in the hotel restaurant; they were visiting Mongolia to pursue studies on Kazakh traditions and culture! 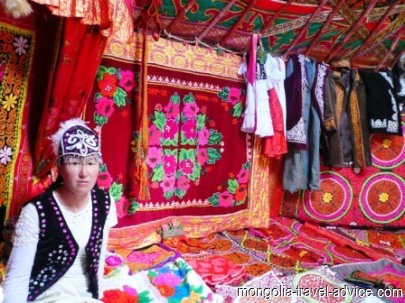 The traditional nomadic culture of Bayan Olgii might be a fantastic and exotic attraction for tourists, but many ethnic Kazakhs are frustrated that modernity and wealth seem to be passing them by. Many have sought a better life in Almatay, the much more developed commercial capital of Kazakhstan which just across the Altai mountains. Numbers of ethnic Kazakhs dropped rapidly in Bayan Olgii during the 1990s as many took the opportunity to emmigrate to Kazakhstan. The Mongolian government has partly succeeded in stemming the flow of emmigration (sadly, some people actually returned to Bayan Olgii after being discriminated against as backward 'immigrants' back in modernized Kazakhstan), but many locals still seem to look to Almatay as the source of opportunity and a better life. I detected some significant differences between Kazakhs and Mongolians, though the the two cultures are fundamentally similar. Between the mud-brick houses and the traditional outfits, you might feel more like you're in Kyrgyzstan or the mountainous regions of Afghanistan as you feel like you're in Mongolia. Apart from the clothing, the most obvious differences stem from Kazakhs being Muslim, and most Mongolians being Tibetan Buddhists (see religion in Mongolia). Both peoples are very proud, tough, and independent (so don't expect strangers to come up and treat you like you're something special!). The following is completely subjective, but after 5 weeks out West I perceived the following differences in Kazakhs, relative to Mongolians. Much less issues with alcoholism, but it is still a problem for some. As with many Muslim cultures, women rarely drink (though airag, or fermented mares milk, seems to be considered acceptable despite it usually being stronger than beer). Maybe it was just me, but it seemed like petty theft was more of a problem out in the Kazakh countryside. The locals were less likely to leave belongings unsecured, and I myself experienced some petty pilfering. Kazakh yurts (gers) are bigger than Mongolian yurts. This is because Kazakhs move to small, mud-brick houses in winter, which are easy to heat. As a result, Kazakhs can make their (summer) yurts with more room and airflow. Mongolians tend to look to the USA as the ideal country to visit, work or study, whereas Kazakhs are more likely to head to Kazakhstan or Turkey. Kazakhs will have Turkish or Kazakh soap operas beamed into their yurts (about a third of yurts have a satellite dishes and solar panel outside these days), and do not watch as much Mongolian-produced television. Kazakhs are a proud people, intent on maintaining their culture, religion, and way of life. 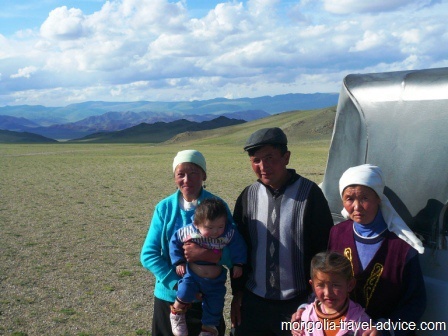 For these reasons, they don't tend to intermingle or intermarry with other ethnic groups in Mongolia. This has lead to some tension between Kazakhs and Mongolians, and there is a level of discrimination apparent in a minority of people. I heard some Mongolians refer to Kazakhs as mean and arrogant, and some Kazakhs called Mongolians 'dirty'. This sectarianism is being exacerbated by some young people voicing intolerance through social media channels. Despite the odd exception, I should stress that the vast majority of Kazakhs and Mongolians speak quite positively of eachother. While most Kazakhs feel positive about Mongolians in general, there is a more common sense that the Mongolian government is intent on discriminating against them. The rapid change affecting much of Mongolia seems to be passing Bayan Olgii by; partly due to its isolation from Ulaanbaatar and partly because the aimag contains none of the mineral wealth like the other aimags. In 2011, many Kazakhs were bitterly speaking of the government replacing local Kazakh bureaucrats with Mongolians so they can 'watch us' and 'take control'. There is even a feeling that the constrictive government regulation of the airline industry (which drives up domestic airfares) is a deliberate attempt to stymy tourism and development in Bayan Olgii. Despite low level frustrations and tensions, it doesn't seem like there will be an escalation in sectarianism any time soon. 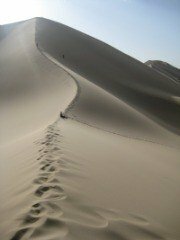 Despite the challenges, the Mongolian Kazakhs have struggled through many hardships over the past two centuries, and no doubt they will continue to overcome any challenges that come their way. Kazakhs still pursue the ancient sport of eagle hunting, which has largely been forgotten in the rest of Mongolia. Bayan Olgii is very remote from the rest of Mongolia; not only geographically (Olgii is as far from Ulan Bator as Paris is from Warsaw), but also culturally and linguistically. For these reasons, having an ethnic Mongolian guide take you through Bayan Olgii will be like being led around by another foreigner. This means you can miss out on insights into Kazakh culture, and opportunities to interact with locals in a more 'natural' or authentic setting may be limited. 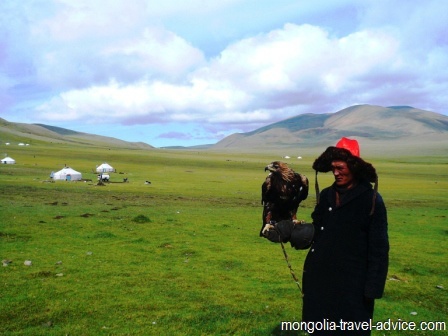 Many UB-based tour companies will tell you a Mongolian guide is fine, but the benefits of having a local guide, who knows the countryside and the language, and has lived among the nomadic families who you'll visit, are invaluable. 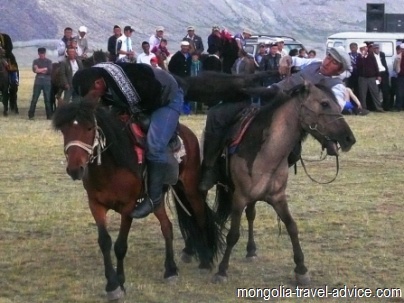 See my page own Tour operators in Western Mongolia to learn more.